Have you ever wondered what it’s like to move forward all day and all night? While most runners, and non-runners for that matter, think of the marathon distance, 26.2 miles, as an ultimate test, it’s really just the longest sprint event for a carb-adapted runner. As I say on my Endurance Training page, it’s a good test of how well you can run until your body runs low on something important. If you’ve learned how to replace the water and electrolytes for a longer run, can you carry that forward, plus keep your energy levels up for extended periods? Click on this photo. This is Kent, looking cheery as he completes a 50 mile race. Like all successful ultramarathoners, Kent has mastered the balancing act of keeping his brain and body working, and staying reasonably comfortable, for indefinite periods. Runners who’ve done hard runs up to the marathon distance, but haven’t learned ultramarathon techniques, tend to imagine the almost all-out intensity of a shorter run continued indefinitely. In fact, an ultra marathoner needs to slow down a bit, taking half step back mentally and physically, so that he or she can sustain longer, learning to consume the fluids and foods necessary to keep moving forward. 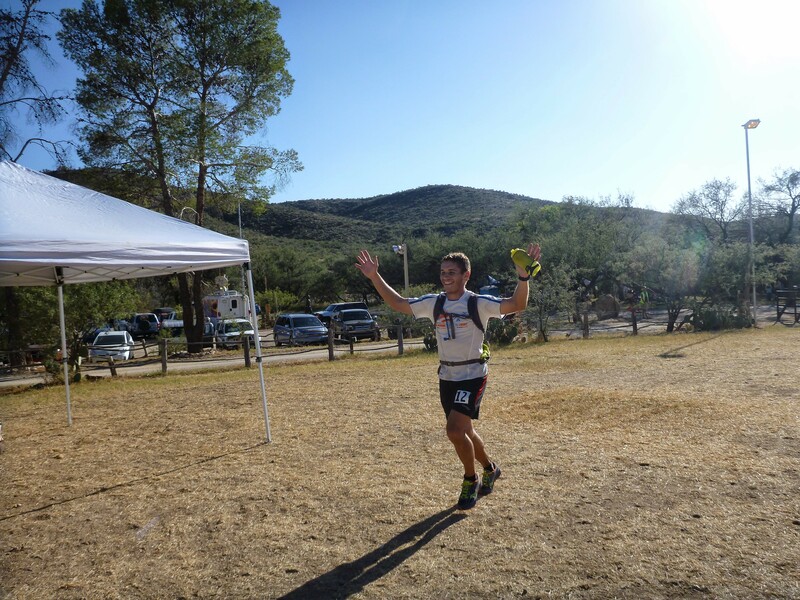 Here’s my view regarding how to successfully complete a multi-hour endurance event. I’ve applied this to running and cycling. This is by no means the definitive guide, just my approach. There are many guides on the Internet and in books. I may add some more in the future. Build your endurance base using the techniques I discuss on the Endurance Training page. My ultra training was essentially marathon training with an occasional long run in which I practiced ultra techniques. I didn’t and don’t use those techniques in most of my shorter runs or rides. Practice taking electrolyte replacements during a long endurance bout. There are capsules and beverages of various sorts. I’ve been using Endurolytes lately, but there are plenty of good choices. The Nuun tablets for water bottles are handy, too. If you’re staying hydrated in a long endurance bout, you won’t lose more than a 2-3 pounds of water weight. Once you’re a couple of hours into the long run or ride, you’ll probably want to start consuming energy replacements if you’re carb-adapted, since you’re using up your glycogen stores. Once you’ve started the “sugar treadmill,” heaven help you if you fall off, i.e. stop supplying sugar to keep your blood sugar up. You’ll go through an overshoot where your blood sugar drops off and you suffer a “bonk” or “sugar crash.” I used to get 6 miles to the Coke or Pepsi in my youth. These days there are several performance drinks that combine fuel (usually sugar derivatives) with electrolytes. I avoided those until I was ready to climb on the sugar treadmill. This issue largely disappears if you master keto-adaptation. There are legal drugs which can help your efforts, but learn their effects on your body. Many runners use Non-steroidal anti-inflammatory drugs (NSAIDs) in long endurance bouts. Ibuprofen is frequently referred to as “Vitamin-I.” Lately, I’ve found two naproxen-sodium before a long day where I’m going to be out moving forward is pretty effective at keeping me more comfortable. Be careful, the NSAIDs can have dangerous effects on your digestive tract and kidneys if you take too much. Many people have some stomach irritation. Like many ultra runners, I’ve discovered the benefits of the spice turmeric, which has potent anti-inflammatory properties, but doesn’t rot your stomach. Stage test runs where you practice your techniques. Years ago, my friends and I staged a 40 mile test run in which we had a truck meet us at various points along the way with supplies and a scales. In the big runs (100s), it’s fairly standard to have a weigh-in before the run. If you lose more than a certain percentage of your weight, you’re made to stop until you rehydrate, or even pulled from the event. It was on one of our test runs that I calibrated my Coke/Pepsi mileage by running until I sugar crashed and came out of it. Think about the things that could reasonably occur and plan your contingencies and back-ups. Don’t try food, drink, shoes, gear, etc on race day that you haven’t tested. If you become keto-adapted some of this gets easier, although some of us have found that we drink more water than when we were carb-adapted. I had enough bottle cages (3) on my bike to get from my house to the first water about 22 miles up Mt. Lemmon Highway– now I need a fourth, for which there’s no room on my bike frame. Most of what I say above still applies, but you are likely to use a little or no sugar (gels, energy drinks, etc.) in your training and racing. I had several packages of Clif Blox in our pantry that dried out and became inedible after I became keto-adapted and stopped using them. Instead in runs and rides, I’ve tried carrying Atkins bars, nuts, sausage slices and Babybel cheeses. Consuming those has become more optional, since there’s no longer a need to keep my blood sugar up. I’m too old and slow for the long runs, but it appears even the keto-adapted find a certain amount of sugar is helpful in 100 mile events, sort of a super charging effect.